The Tina Fey-produced show is available for binge-watching now. It stars Ellie Kemper (NBC’s The Office) as a woman rescued from a bunker, where she and three other women had lived after being kidnapped by a wacko, doomsday preacher. It revolves around her adventures, post-bunker, when she moves to NYC. If you enjoy sly pop culture and political references, snappy dialog, and the same kind of slightly off-kilter sensibilities last seen in “Pushing Daises,” THIS is the show for you. Now you might expect, from the description, that this would be yet another show taking pot shots at the Right, Christianity, et all. Nope. It is an Equal-Opportunity Destroyer of every sacred political and social cow on the Left, Right AND Center. In the latest episode I caught, Kimmy’s best friend, a (flaming) gay black actor, goes to a mentor to teach him how to pass for straight. By the time they are through, they’ve skewered straights, gays, and singled out Tom Cruise, George Clooney, Barak Obama (!) and Hulk Hogan for attention. Fearlessly. So…if you noticed the click-bait headline, you might be wondering at how this show will End TV As We Know It™. Simple. Content is King, and Better content = happier viewers. The problem with the networks (broadcast AND cable) is that they revel in mediocrity. They’ll air damn near anything they think will get a viewer with a pulse, and anything that is fresh, fun, exciting, and different gets on the air ONLY by accident. But subscription services like Netflix are different. Fearless. Original. 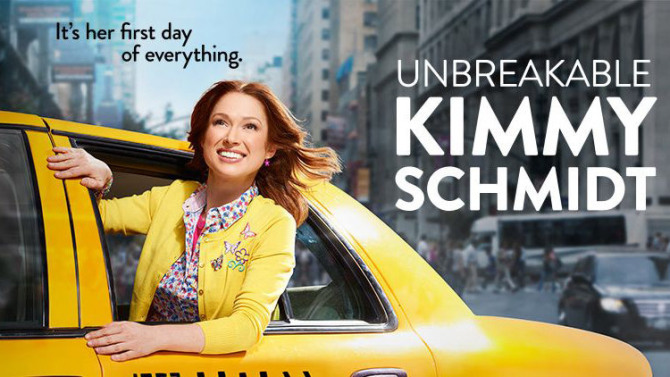 “Unbreakable Kimmy Schmidt” is a show that, by rights, ought to be on NBC, what with their relationship with Tina Fey. It isn’t. Instead, it’s on Netflix. And this show, (along with “House of Cards,” “Orange is the New Black,” as well as their other original programming) is why cable and network TV are on their way out. Why would ANYbody want to be held hostage to a network dolling out one episode at a time, when you can go to Netflix (or Hulu Plus or Amazon Prime) and watch an entire season of a show whenever you want? If you own stock in cable or satellite companies, sell now. Netflix, Hulu and Amazon are the future. The Cable Cabal’s day’s are numbered. It’s destiny? A dumb pipe.